50% of women who need Progesterone also need Estrogen. To find out if you’re one of them, scroll down and fill out the survey that best fits your situation. We will let you know immediately! My name is Sindi Holmlund and I am the developer and manufacturer of Nature’s Balance Progesterone Cream. I have been making and selling Bioidentical Hormone Replacement Therapy for 19 years, and have consulted 1,000’s of women (and men) on how to regain balance and relieve the symptoms associated with Hormone decline, and I would like to help you too.One thing you should know is that your hormones don’t start changing at 50 years of age, they start declining at the end of puberty (18-20 years of age), and continue to do so until around age 60. This evolution is called The Lifetime Hormone Cycle. As you move through the different Stages of The Lifetime Hormone Cycle, you will experience different sets of symptoms. At first they will be mild and intermittent, like a bit of PMS a few days before you period. But as time goes on and your hormones decline further and further, you your symptoms will become more frequent and more severe. At first you will lose your Progesterone and only need to replace it. But there will come a day when you will need to start replacing your estrogen too. Progesterone helps protect women from reproductive cancers so it’s VERY important that you use the highest quality progesterone available. It should not contain Wild Yam extract, or any other herbs, be free from cancer causing chemicals, and be made properly. Our BHRT creams are made with pharmaceutical grade progesterone and made to USP (United States Pharmacopeia, the pharmacist’s recipe book) standards. I also manufacture and sell a high quality estradiol cream but I do not sell it on Amazon because I want to make sure that the women who purchase it also purchase and use my high quality progesterone along with it to keep themselves protected. Approximately 50% of the women who use my progesterone cream also need, and use, my estradiol. If you need estrogen and only use progesterone it can make your symptoms worse by creating a bigger imbalance. To find out if you also need estrogen, please fill out the questionnaire below that fits your situation. We will send you a response right away with instructions on additional products that will help eradicate your symptoms and help protect you. The e-mail will include instructions to purchase all the educational materials I have written to date. My other 3 booklets, 36 pages (with loads of illustrations) of information about how to use BHRT, and about 50 Frequently Asked Questions. You will also receive my personal phone number and e-mail to be able to get in touch with me with questions or if you need help, for which there is no charge. 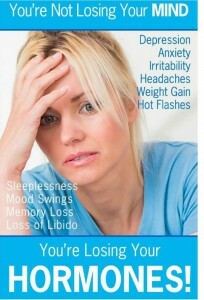 As a sample of the type of information you will be getting, please accept a FREE copy of my first booklet “You’re Not Losing your MIND, You’re Losing Your HORMONES! ”. Just CLICK HERE or on the book cover and save to your favorites.